Andrew Halcro last week wrote a succinct piece on an all too common tragedy in Alaska and New Mexico. At first glance it had all the makings of a Hollywood movie set. But this was no Hollywood movie set, it was my front yard on Sand Lake and it was 3am on June 10. For two days, fire and police vehicles were fixtures in my front yard, as the search for a missing canoeist continued. Family members gathered outside my front window, watching and waiting as they held hands, cried and prayed…. One APD officer on the scene told me that these kinds of tragedies are all too frequently due to an unfortunate combination of events. … In this case, the costliest hole was when the two young men launched their canoe at the public access point, they walked right past a newly erected life jacket stand that offered boaters free personal flotations devices. Alaska initiated the “Kids Don’t Float” program. Fireman Bob Painter of Homer founded the program after a number of children drowned in Homer. 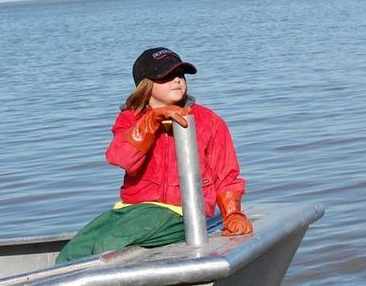 (May 29, 2009, Anchorage, Alaska) – The “Kids Don’t Float” and boating safety programs will continue this summer… Under these boating safety programs, children learn about boating safety in schools, and life jackets are available for loan at many lakes and rivers across Alaska. …Representative Mark Neuman of Wasilla sponsored HB 151 and Governor Palin signed the legislation in May. Both NM and Alaska rank high in the USA for the prevalence of drownings (the number of deaths divided by the population). Alaska is a semi-arid region with a lot of riparian and coast line; New Mexico is a semi-arid region. Both states share a cultural norm that things go better with alcohol, especially if activities involve an engine (boat, auto, snowmachine). Both states seem to believe “accidents” [not my fault] are always happening but ones with bad consequences only happen to others, the less deserving. The state law allows adults to endanger themselves, but not underage children. A child’s coloring book encourages children to grow up to remember the law’s requirements. in Alaska, and encourage all boaters to make their boating memories this season good ones by always wearing life jackets, carefully preparing for each trip, carrying appropriate communications and signaling devices, and by serving as a positive example on the water for other boaters. To test a life jacket, lift it at the shoulders. If the life jacket comes up over the ears, it is too big. Test Alaska child's PFD fit. Will she slip out of unzipped PFD on open boat? A 56-year-old man drowned in Bristol Bay this morning, the Coast Guard said. He was fishing in an 18-foot skiff with his two teenage daughters when he went overboard while pulling in a net, said Coast Guard spokeswoman Sara Francis. … The accident happened in Togiak Bay around 9 a.m. and a nearby fisherman immediately called for Coast Guard help. The skiff was only 10 to 20 yards from shore but the man was not wearing a life jacket. 2009-08-11 Very nice picture guide to Alaska Safe Boating Course. Nieman Foundation for Journalism at Harvard held a conference about reporting on pandemics. Excerpts from the conference were published on-line in the Spring 2007 Nieman Reports. Avian Flu, A Pandemic & the Role of Journalists: Excerpts From a Conference From November 30 until December 2, 2006, discussion at the Nieman Foundation … “The Next Big Health Crisis — And How to Cover It” brought journalists together with scientists, public health officials, medical experts, academic researchers, law enforcement officers, public policy experts, and Homeland Security officials to talk about how best to prepare for the possible arrival of pandemic flu. We’ve mentioned previously how important history is for understanding the science of pandemics and how people respond (good and bad examples). The folks around Seattle Washington have used history in an unusual format to present the need for preparedness and how to begin getting prepared. The comic or “graphic novel” format doesn’t trivialize the problem or the audience. Instead, it can help by removing the reader a step from the grim necessity (as a comic and as a historical dramatization) and by presenting the essence of preparation graphically, followed by resources for further study. To promote pandemic flu preparedness, Public Health – Seattle & King County has developed a 12-page comic book on pandemic flu. Targeting readers of all ages, this story tells the tale of a family’s experience of the 1918 influenza pandemic. It also explains the threat of pandemic flu today, illustrates what to expect during a pandemic (such as school closures), and offers tips to help households prepare. Describes a disaster preparedness training program for tribal leaders conducted in Arizona. Discusses the role of cultural competency, respect for tribal sovereignty, solicitation of historical examples of indigenous preparedness, and incorporation of tribal community networks in the success of the program. There were several challenges to implementing the trainings in the field. These were mostly created by the very short timeline for the project due to funding restrictions. This meant there was little time to visit in the field with key stakeholders and to further encourage participation. As a result, the identification of the training participants was left almost entirely to the BT Coordinator for each tribe. Given the newness of many of these individuals to a newly created role, not all of these coordinators were well integrated into their local public health system. Some were not based within their health programs, but rather operated out of their emergency management departments. As a result several trainings had limited public health personnel participation. Additionally the scope of the project was very broad as it encompassed all five regions within the state, and required cooperation between tribal, county and federal agency counterparts. Fragmentation within each local public health system resulted in some communication breakdowns and last minute requests. Other challenges to participation in the training included limited resources available to the tribes. In some cases there were no travel funds for relevant personnel to attend the training session. In other instances, public health emergency preparedness and issues of bioterrorism were not considered priorities particularly compared other competing needs facing under-funded tribal health programs. Subsequently, there were several of the tribes whose BT coordinators and public health personnel were not represented at the training. In regards to the curriculum, a “one-size fits all” approach created some challenges to meeting the needs of the audience. Due to the diverse backgrounds, roles and skills sets of the participants it was difficult to find the right pitch for all. For some it was too basic and for others too advanced. The content areas required for each module were very broad and it was difficult to present all the content comfortably in three half-day sessions. A new Web page that addresses emergency and disaster preparedness and special populations has been added to the National Library of Medicine (NLM) Enviro-Health Links to selected Web sites featuring emergency preparedness for special populations. This includes people with disabilities, people with visual or hearing impairments, senior citizens, children, and women. Links to information in languages other than English are also provided. Lynne asks how old a baby can be before a caregiver (or stranger) cuts back on frequency of handwashing before touching the child. I haven’t kept up with the latest pediatric advice. I would check with a doctor first or the university extension program, especially about a specific baby. Surprisingly, this is another topic difficult to locate specifics for implementation. I suspect the information needed (with supporting documentation) is there, just locked behind subscriptions and as an unfunded person I can’t get to it. Lynne’s question is really about assessing risk. Here are general guidelines. We aren’t talking about neonates (newborn) nor day care and play groups nor nurseries. We aren’t speaking of health care providers (who are exposed to many ill people). In general, my guess would be 18 months is an age when others can resume everyday handwashing, certainly no sooner than 12 months or whenever infants can get around on their own (crawling or scooting). Their immune system should be in good shape then. If I remember my development biology correctly, babies get some immunity protection from their mothers for the first few months, while they switch over to their own developing system. However, getting born is a shock. Babies even experience a growth suppression then growth spurt. A lot is going on with them, so hand hygiene by others is important. * everyone should practice good hygiene (not excessive germ phobia) because as people we share our environment This includes keeping the living areas clean and dry. * babies are developing their own immune systems. They need exposure to the normal environment, but intense exposure or exposure to contaminated environments can overwhelm. As babies get older, regular hand hygiene *by everyone* should be sufficient (by everyone is the key) for simple contact with the baby. That is, wash hands after bathroom use, after food preparation, after returning home from work, after contact sports, after petting the cow, etc. I’m not real happy with this answer because I think it is too general. However, I’ll keep looking. I don’t really trust a lot of those new baby books either, but I don’t have access to their science to evaluate them. If anyone runs across a better suggestion, please let us know. The Council of Canadian Academies was asked by the Government of Canada to undertake an assessment on the modes of transmission of influenza and the contribution of respirators or surgical masks towards inhibiting the spread of the virus. Question: How and where is influenza (both seasonal and pandemic) transmitted? Based on the conclusions of this review, what is the contribution that N95 respirators or surgical masks will make in the prevention of transmission of influenza? Kindly write to the %age proportion of Castor Oil Soap-35% being used to formulate Antiseptic Liquid Like Dettol. * why is the soap made from castor oil? If I have failed to ask and/or answer your questions correctly please let me know. If anyone can provide additional references or a better discussion, please note in the comments. Unfortunately, I am not an organic chemist so I can’t give great detail. But here is what I think is the short answer. The soap is used to keep the germicide (cresol or phenol) in solution until it is mixed with water for actual use (the cloudy mixed result indicates the phenol compound becoming suspended rather than dissolved). Soap is made from a fat or oil and an alkali. Castor oil has particular physical properties which make it a good molecule for making the soap to interact with the cresol/phenol molecule. I have added below some references for further examination but in particular the chemical references or databases used for the lay term lysol, Lysol ® and Dettol ®. I have tried at the end to give the identification numbers for the compounds under discussion. These ID numbers, for example the CAS number, are unique to a chemical compound. The use is similar to the binomial scientific name used to specify which of the very many different plants in different cultures that have the same common name. These databases can also be searched for the chemical or toxic properties of other chemicals. The Chemical Abstract Service (CAS) the 100-year old database of the American Chemical Society, is an excellent resource but only available for a fee. There is a comparable US Pharmacopoeia (USP) and a British Pharmacopoeia (BP) but perhaps someone else can locate the Internet links to these databases. CIDRAP which has been recommended before points to a new effort of the US government to get local governments busy participating in community preparedness. He said the gap between what public health experts know and what the public knows about pandemic planning is still very large, and more work is needed, particularly on community mitigation efforts that may be needed in a severe pandemic, such as school closures and student dismissals. One component that seems to be missing from the HHS toolkit is a plan for distributing it to community leaders who are well positioned to use the materials, Dworkin said. “As of right now, they are available online, but who knows about them? How will community leaders, school boards, and others learn about their existence?” he asked. Answer: readers please talk this up among your tribal councils and churches. Maybe eventually the school districts and regional hubs (such as Bethel) will get busy. One of the Tundra Teachers ** I read was able to take advantage of the flu shot clinic this weekend. Actually, it was the mass dispensing exercise to demonstrate disaster preparation in the region, held for the second year. I can see how someone last year must have thought it was “more authentic” to issue a pretend pass to a non-existent shelter; unacceptable but plausible. But, again? Who has the authority to declare an Infectious Disease Outbreak? Why is there a non-existent shelter for disease outbreaks and not for flooding, electrical explosion, chemical fire? What happens if a member of your family or a neighbor didn’t get a flu shot at the mass dispensing– Will they be denied access to the non-existent shelter? What if I lend my card to an elder? Can I bring my active TB? How effective are official false hope and rumors in risk communication, preparedness, and disaster mitigation? What will you E-mail the Governor?